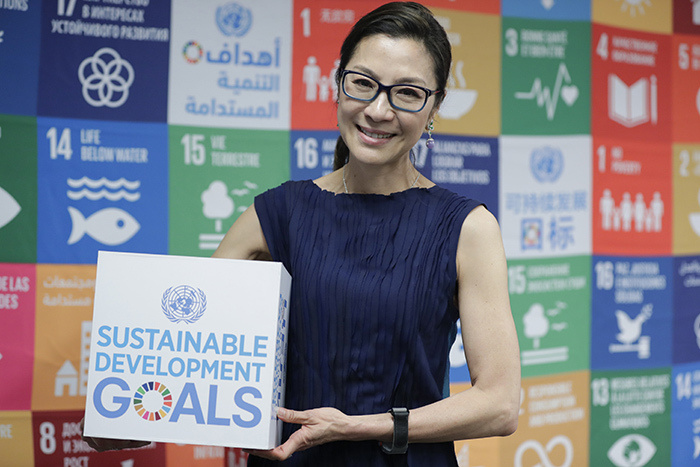 United Nations, New York, USA, July 16, 2018 – Actress Michelle Yeoh, UN Development Programme Goodwill Ambassador Advocating for the SDGs today at the UN Headquarters in New York. UNITED NATIONS, July 16 — Actor Michelle Yeoh has been on a journey to find an outfit that that does not damage the Earth. On July 16 she brought to the UN in New York a film about her quest, called “Made in Forests.” It was presented during the High-level Political Forum for Sustainable Development, and features Italy’s Cittadellarte Fashion B.E.S.T., an art foundation that promotes sustainable fashion design through art and education. There designer Tiziano Guardini created a dress for Yeoh made entirely of certified sustainable wood-based fibers. Speaking on the sideline of the High-level Political Forum, Yeoh recounted how she became a Goodwill Ambassador for the UN Development Program two years ago, and undertaken missions from UNDP to places such as China and post-earthquake Nepal. She emphasized Sustainable Development Goals 1, the eradication of poverty, and Goal 5, gender equality, saying you can’t have one without the other. She listed road safety, AIDS and cancer as among her most pressing concerns. “Made in Forests” is an 8-minute video produced by the UN Economic Commission for Europe / Food and Agriculture Organization’s (UNECE/FAO) Forestry and Timber Section together with the United Nations Television in Geneva. “Made in Forests” highlights how conventional material choices rely predominantly on cotton and polyester – two materials with a high environmental impact. Cotton uses large amounts pesticides and insecticides, and very large amounts of water. Polyester is made from fossil fuels: each time polyester clothes are washed they release tiny plastic microfibers that often end up in the oceans, harming marine life and polluting our food chain.